Sometimes the best way to see yourself is to see the way others see you. Lemonade Joe is a parody of all things American, seen with the eye of an Eastern European, through the lens our own early and idealized Western movies. But Lemonade Joe doesn’t limit itself to just the super-stylized American Western. American gun culture, violence, puritanical abstinence, and all-consuming capitalism get sent up too. For instance, the lemonade that gives Joe his name is called ‘Kolaloka’ which I don’t think you have to twist too far to get Coca-Cola. Before McDonald’s or rap, Coca-Cola was the symbol of capitalist America. That soft drink was both despised and desired (a point humorously made in Billy Wilder’s One Two Three (1961) where the Russian guards at Check Point Charlie in divided Berlin could be bribed with a sixpack of Coke). The antithesis of Kolaloka is Trigger Whiskey, but in this film both are just product to be amusingly bought and sold with equal mindless zeal by the lumpen public. It’s a good thing he is so handy with the guns because he’s dressed in all-white “Singing Cowboy” drag with black piping, which will draw fire from any saloon crowd, just on principle alone. And that’s the whole point of Joe. He’s the ultimate Western good guy, the straight shooter, Alan Ladd, Gary Cooper, Gene Autry, and Roy Rogers all rolled into one white-bread package. And did I mention he can sing too? Also come to set Stetson City on the path to righteousness are the blonde and beautiful Winifred (Olga Schoberova AKA Olinka Berova) and her father who represent the Arizona Revival, a temperance group bent on stamping out the evil of distilled spirits. As a counterweight to Winifred, there is the chief saloon floozy Tornado Lou (Kveta Fialovç) as brunette and bad as Winifred is blonde and good. After you do the simple math of (gorgeous and virtuous maiden) + (rowdy drunk bar crowd) = (damsel in distress), the stage is set for Joe to come through the swinging saloon doors. He is a dry ray of law, order and immediate justice. Both the girls fall for Joe at first sight and Tornado Lou sings her heart-melting melody “When the Smoke Thickens in the Bar, Do You See My Moist Lips?”. Boy sister, do we, and how! If you don’t see the impending abduction of Winifred, betrayal of Joe, his miraculous comeback and happy ending, then you’ve just arrived to this planet. What you may not anticipate (and I don’t think I’m spoiling the plot here) is the ultimate union of all involved, including Trigger Whisky and Kolaloka into a new product named Wiskola. The mind reels! But the plot line isn’t the main point in Lemonade Joe. Rather, it’s the parade of Western (both in the sense of “cowboy” and in the sense of opposition to the Warsaw Pact) archetypes. Leading this parade is Joe himself. You can’t keep a good man down and in Joe’s case this is the literal truth. He can be shot point blank multiple times and appear in the next scene with his arm in a sling. He emerges from a fireplace covered in soot and a couple of steps later he is pristine and white again. All of this pokes fun at the improbable Western film hero. The flashing smile, the upright character, and the deadeye accuracy are all classic clichés. And the clichés come fast and furious in Lemonade Joe. In bar fights someone is inevitably knocked through a banister to the floor below (this happens multiple times). Joe doesn’t just shoot his opponent, he wings him in the wrist or, in one case, shoots the pants off a bad guy. All the pistoling is done with calm aplomb, and often over the shoulder. As good as Joe is, the bad guys are just as bad as they can be. They’re old-fashioned “Black Bart” villains that sprang from 19th century melodramas. They lie, cheat, and try to steal Nell’s farm and usually Nell as well. There is an amusing, if accidental, parallel here with the HBO series Deadwood in that badman saloon owner Doug Badman looks and acts like bad man saloon owner Cy Tolliver. While Doug’s even-worse brother Horace puts me in mind of Deadwood’s Al Swearengen. That is, if Al was crossed with Snidely Whiplash from the old Dudley Do-Right cartoons. In fact there are several cartoon gimmicks in Lemonade Joe and, according to the notes provided by the distributor, the screenplay was written by Jiri Brdecka who wrote and directed animated films. In one instance, the bad guys telegraph signals to each other during a poker game by blowing impossible animated smoke rings to each other. This makes Lemonade Joe a broad farce, but more like a European circus clown, rather than an American slapstick comedy. The highly choreographed bar fights often look like a three-ring circus of tumblers and the trick mounts of horses lack only the tights and spangles of the big top. However, it is strange that Joe never plays a guitar. 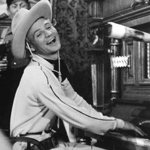 A real singing cowboy will be as handy with a guitar as his guns. Tom Berringer played a guitar in Rustlers Rhapsody, the 1985 US film that has the same satirical take on good-guy singing cowboy films. But for some reason Joe only plays the piano. Maybe it’s the European cabaret influence again. In sum, Lemonade Joe is a real treat and I’m sorry I never saw it 40 years ago when it was new. Hopalong Cassidy, The Lone Ranger and Lash LaRue ride again in a demented way with Lemonade Joe. There might have been a time when some of Lemonade Joe was cutting satire, but today it’s all affable buffoonery. If you are not familiar with the style of an old Republic Films western, you might miss a few of the jokes, but the over all surreal effect can be appreciated by anyone. I recommend that you put your feet up, grab a bowl of popcorn and a frosty cola of choice, dim the lights and go back to a simpler time when cowboys could sing sweet, shoot straight, loved their horse (but not in that way) and their girl (but not in that way either) and justice triumphed in the end. Yes, I’m referring to 1964. And remember kids, stay sober and shoot straight. The best (and only) extra features are a nice set of accompanying notes. Picture quality is good. Sound quality is only fair, but probably wasn’t great to start with.